Thank you again for being a part of this blog, thanks again to you, we will hit 12000 hits on this blog in June, 4 away from that as of last night and wow – I hope many of you contribute and add comments as we go along too – thank you so much! 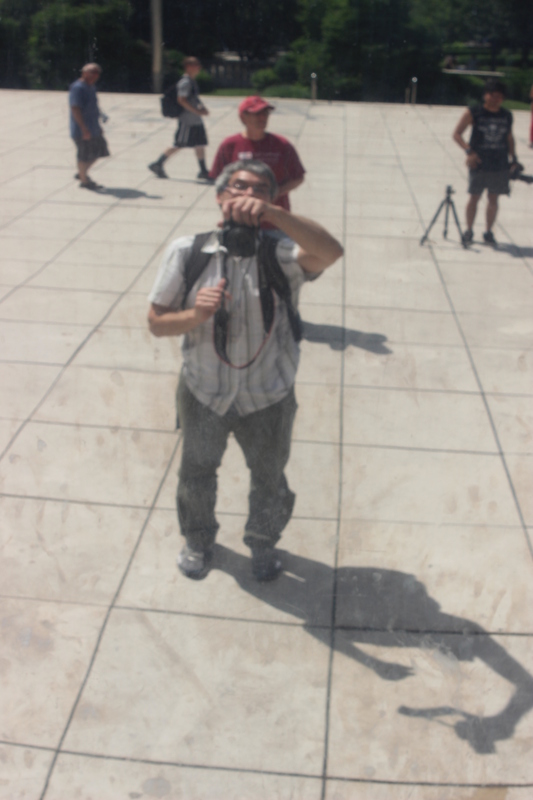 Me, yes, at the Chicago Bean! Let me start what is freshest – Chicago. ALA Conference. Two years ago I was here in the cold of November for NCTE it seems so long ago – and now it is sunny, warm, amazingly humid (it feels good !) and find myself at a restaurant right now, for breakfast down from the Chicago Hilton, this restaurant called Brasserie – wow – beautiful front windows, 10.00 crepes, and worth every penny. I laughed because I am having a crepe filled with Nutella and covered with fruit, the Nutella brought me back to Mexico… The crepe is amazing and I have a couple (mother and child) sitting beside me speaking French, so it seems perfect – the crepe, ohmygosh, I want tons of them, lol Delicious, soft and the right touch of Nutella! The French music on top of that all was also a great idea! Last Night coming in, I arrived at 10:00 PM roughly, made it through extensive lines of baggage and then, hit my first sub place in ages, it was nothing upper exciting but DELICIOUS – DELICIOUS – and packed to the hilt. The two employees were so incredibly welcoming and nice (the chef and his partner, though his partner was shy for the camera). It was a very warm welcome to Chicago – and I loved this as my first American meal – it was delicious – and they were so welcoming ; what else could you ask for after a long flight. The anticipation leading up to the flight… I love a good story and this is one! I get to the airport, all is well – checked in, baggage, no problem…I am there way early, and managed to see on the way to the general terminal yes. American Airlines in on the board, just no designated gate yet…no problem, right? Sure enough ta da! HERE! YEAH! While waiting, Sharon gave me a long list of must see’s in Chicago (her hometown). I won’t tell them all to you right now, BUT, I am planning on seeing them all! J We landed, made it out, I took the Blue Line metro to close to the Chicago Hilton, and arrived at the AWESOME hoagie place listed above – a hoagie, submarine, hero, whatever you want to call it, it was AWESOME having it after so long! I plunked down exhausted and found they did make a mistake, I received a HUGE 2 bathroom hotel room with 2 separate double beds, and I thought, Sure, I will keep this room! I was out the door and to the very interesting search was to find breakfast and get back for the 8:30 Freedom to Read meeting. WOW. You’ll have to see also the comments on the restaurant page (#’s 71-73 in Chicago so far!) that I experienced, AWESOME – awesome restaurant, awesome place, great way to start out the day! It was a GREAT first day of PREConference, and overall, I was VERY excited. There is MUCH potential with being among international folk to contribute so many cool aspects to what is going on in the world, and if you have someone willing to roll up their sleeves, and be willing to be active as well in the middle of things, then you begin to see how someone as a librarian is truly your most valuable asset to a school hands down. I like the diversity being a librarian offers and can hand you, and in turn what you can turn around and hand to others. Let me say, the Chicago Public Library? IMPRESSIVE! After that exciting part, I quickly exited as they went into parts of the session that were covered in the handouts I had, then, I printed out a copy of my employee id, (me!) Harry to show I was a librarian for access into the museum and other places for a discount, as wel as other session that would let me in with proof I was in education ( I did not think to bring my school id,) ;( from the Fed Ex office (excellent service there actually, cool! ), travelled to the Convention Center, holy cow, it takes up like 6 blocks, lol…a palace! – THEN – onto getting my registration, signing up for a 5k (yes, I did) – my first one in YEARS, lol….it should be interesting…. :) – Heading from there to the hotel and finding some orientation and taking tons of pictures of Chicago, you can see on my Facebook album now, the sky yesterday? Picture perfect! 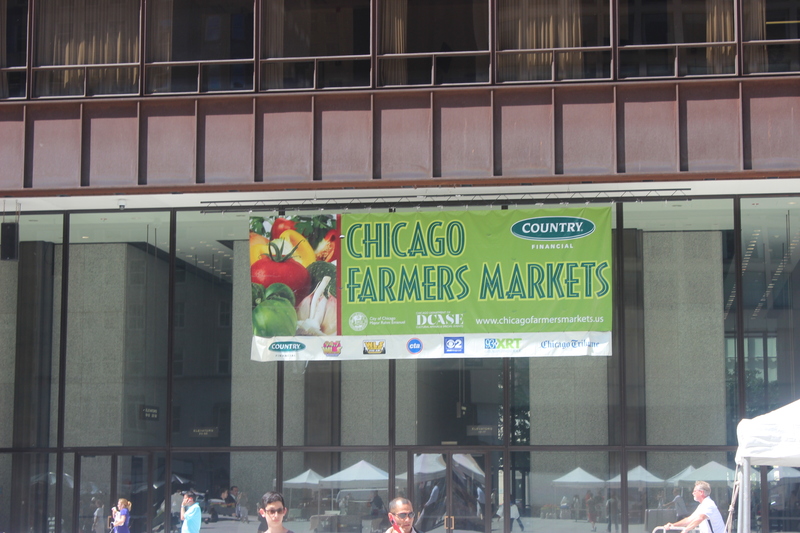 However, the Farmer’s Market with Rhubarb jam – DELICIOUS! Little did I know I’d have to eat the whole jar trying to get on the plane, but, it was DELICIOUS, just in one helping! I wanted more take back with me! I tried out the reception held by the Freedom to Read Foundation but I was too late, getting the time wrong when I got there, no food, and most of the people had already oriented themselves 😉 It was fine as I settled in and even now, as I prepare to go see the Blackhawk Hockey celebration – I am trying to get the backlog of blogs done today. I feel like I have had a good start to Chicago and look forward to the list of items I received from Sharon, at the airport, that I needed to see and do in Chicago – stay tuned! I liked the ONE Book, ONE city idea! Here we go, my first ALA experience and hoping it will be memorable. The sites, and places to see have been amazing, so all in all, if it were cut short already, I’ve had some amazing opportunities! The one deep thought I had on the plane from Mexico City to here, was how amazingly blessed I have been to have had the students, friends, and family supporting me in all my endeavors. I truly believe you can do anything, go anywhere, and impact a wide circle of people when you have others believing in you – there is no doubt in my mind whatsoever. I am proof that whatever you want to do, you can do. I still believe this today no doubt. The most powerful things to overcome are not people in your way, not situations and not conflicts (even though they seem to be the largest obstacles at the time), but your mind. I realize there is no hesitation needed to be bold and successful and have an exciting life. I saw the slogan in the window of Chicago’s Columbia School that said, “Live what you love.” I think that not only should be a conference title, but the title of may people’s lives, as if you do that, I don’t think you can go wrong. There are enough signs along the way to tell you if you are on the right track. Add to that the exciting points in history of the Pittsburgh Pirates batting into the first place since, sheesh, 1997 when the slogan was “It’s a freak show!” to now, “Raise the jolly Roger!” (I liked the freak show one 😉 – the legislation that has occurred with changing immigration, also the gay marriage decisions, as so much more, there is SO much and so many places people can be a part of something and make an impact!